My truck reminded me this morning that colder evening temperatures means the loss of tire pressure. The cold causes your tires to contract and you’ll lose about 1 pound of air pressure for every 10 degree Fahrenheit drop in temperature. My vehicles have TPMS or Tire Pressure Monitoring Systems on them to warn you when your tire’s pressure goes below a set threshold. In my case they warn me when my pressure has dropped below 32 PSI (pounds per square inch). If your vehicle is not equipped with a monitoring system be sure to check your pressure yourself with a tire pressure gauge. These are cheap insurance and something any vehicle owner should have in their glove box. In any case you’ll need one to be sure you’ve put the appropriate amount of air in your vehicle. For the sake of completeness I’m going to walk through putting the appropriate amount of air in your tires. If you know your business here skip to the next section otherwise read on. Your vehicle should have a sticker located usually on the driver’s side door post, you’ll need to have your door open to see it. On the placard you’ll see recommended tire pressure for your front and rear tires. Often these will be the same but you should always use the recommended settings. You could also find the tire PSI recommendations in your owners manual. Now you just need to put the air in your tires. If you do not have an air compressor or tire pump at your current location head to a gas station where most will have some form of air system either free or for a few quarters. Add air to the tires a little at a time then check with your air gauge. If you overshot the PSI setting just let a little air out using the cap or just putting your gauge on partially to let a little air escape. That’s it. Why Does Tire Pressure Matter? You should need no more reason than safety. 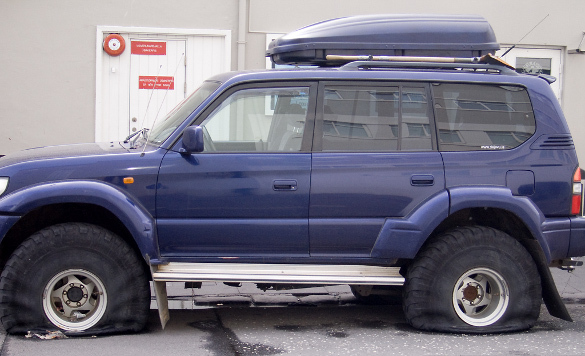 Having under-inflated tires can change the handling characteristics of your vehicle possibly causing an accident. Further you might be more likely to get a flat tire if your tires are under-inflated. And less important but also something to consider is the impact to your gas mileage by having improperly inflated tires. According to the U.S. Department of Energy’s Fuel Economy Guide you lower your gas mileage by 0.3% for every 1 PSI drop below your recommended tire pressure. So as the mercury drops so does your gas mileage unless you keep your tires inflated properly. Great tip. This is definitely on my “to do” list for this week. I’m a big fan of the round tire guages. They don’t seem to be as problematic as the stick ones. I’d also recommend replacing wiper blades before it gets cold. Replacing blades in October is a lot more fun than doing it in a Wal-Mart parking lot with a wind chill of -40 in mid-January. Stash the old set in the trunk for emergencies (i.e. a blade breaks). The recommended pressure on the door frame is the cold tire pressure. If you have to drive more than a mile or two to a gas station, you will likely under-inflate your tires because the pressure is higher in warm tires. Here’s what you need to do: 1) Measure the tire pressure in all four tires before you head for the gas station. 2) Subract the current pressure of each tire from the recommended pressure. 3) When you get to the gas station, measure the tire pressure again and then add the number of lbs. of pressure you calculated for each tire in step 2. You are the man Paul. Thanks for the tips. I hate checking the tire pressure but I make sure to do it on weekends as I drive out of town every other weekend. My boyfriend used to make me do this every Sunday so that I would get in the habit and I bought a digital pressure gauge since that stick thing drives me crazy. I have now gotten into the habit of checking my pressure after I wash the car as well so I am pretty much checking my pressure every weekend. A bit much I know but I am so clueless about cars that I prefer to overdo it and be safe. I am now going to get those caps that change color when your pressure is getting low…my ex has them on his car and it saves him time because if it is green then he does not bother…but you can easily see if it is yellow or red. That reminds me I also need to check my oil!!!!!!! Thank you for sharing your experience and tips. I usually browse the internet first to find out which tools that has the best price and quality. Next post: Layaway: a Formal Delayed Gratification Program?